Fresno peppers are similar in shape and heat to jalape�o peppers (5-700 SHU) and are grown extensively in California, Texas and New Mexico. This cold tolerant plant grow approximately 2-2.5 ft tall by 20 inches wide and are prolific beaers of upright arrow shaped 2-3 inch long by 1in wide peppers which mature from bright green to orange to a beautiful deep red . The peppers have a slight sweetness about them and are fantastic when used fresh for salsas. Also known as Chile Carbide orChile Cera. A large Jalapeno variety from Liberty seeds who say pods average 10 x 4 cm in size, weighing 36 g. 70 days to maturity. This is quite a prodctive variety, with medium hot peppers of quite uniform size. A F1 hybridised Jalapeno variety developed by Johnny's Seed. Similar in appearence to 'Conchos' but is said to have slightly larger fruit with narrower shoulders. Also said to be less prone to checking (cracks in skin). 67 days to green, 90 days to red. 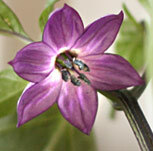 The Purple Jalapeno is a beautiful, ornamental version of the standard Jalapeno pepper. The plants are very productive with a single plant producing upto 50 pods which begin as a brilliant emerald green, then mature to a stunning dark purple and finally to a fabulous scarlet red! As the plants often have chiles on them of varying ages, all three colors are often seen on a single plant which produces a most wonderful and most beautiful color effect! Though Purple Jalapenos may be beautiful, don't let their brilliant colours fool you as this variety rates at a respecatable 6000 scoville heat units which is twice as hot as a standard Jalapeno. Pimientos de Padr�n are small green peppers named after a town in Galicia Spain. They are usually fried in salt and served as a tapa. At their best, eating them is rather like playing Russian Roulette; although they are all delicious, about one in five will blow a hole in the top of your skull! Sometimes almost all of them are highly explosive; occasionally, an entire batch is sweet. PIRI-PIRI is a Swahili word meaning �pepper-pepper� referring to any peppers. In Portugal, it has come to mean the small fiery hot pepper, found hanging in garlands in all the markets. No chicken is ever ordered in an Algarve restaurant without the question �Com piri-piri?� (with piri-piri?) being asked. Portuguese traders then carried the seeds to their African colonies of Angola and Mozambique. From there, they spread across Africa, along with their Swahili name �piri-piri�. To complete the circle, some of the small hot pods were brought back to Portugal, where they have kept their Swahili name up to the present day. Tabasco peppers are the only types of Capsicum frutescens that are well known in North America. These fiery little jewels are the primary ingrediant in tabasco sauce, the famous hot sauce that has been produced in southern Louisiana since 1848 when the peppers were first imported from the State of Tabasco in Mexico. Growers today cannot keep up with demand and tabasco peppers are imported from Columbia and Central America to be mashed in Louisiana. The tabasco plant can grow upto 4-6 feet tall and is just loaded with slender 1.5in upright pods which mature from light green to orange and then to red approximately 75 days after transplanting. Originally from somewhat swampy regions it prefers hot and humid conditions for maximum productivity. 50,000-80,000 SHU. 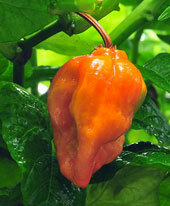 This variety is closely linked to the 7 Pot/Pod and Trinidad Scorpion landrace varieties. It may or may not be a different variety.